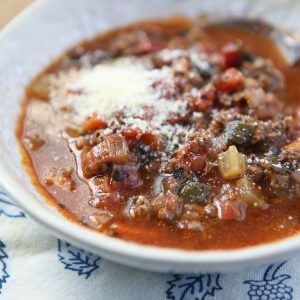 This hearty Beef and Tomato Vegetable Soup is packed with flavor, veggies and protein. Everything you crave all in one healthy bowl! In a large soup pot, heat oil over medium heat. Add onions, celery and carrots and cook for 3-5 minutes until soft and fragrant. Add lean ground beef and crumble using a wooden spoon. Season with salt and pepper and continue to cook until beef is completely browned. Add 2 cans fire roasted tomatoes, water and chicken broth. Bring to a boil, then back down to a simmer. Let simmer for about 15 minutes. Add Swiss chard to soup and cook for an additional 5 minutes. Taste for salt and pepper and adjust. Serve with Parmesan cheese.